VINTAGE COSTUME ANTIQUE ESTATE JEWELRY BROOCHES AND PINS! 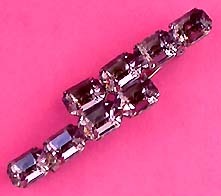 Art Deco Emerald Cut Amethyst Crystal Silvertone Vintage Antique Bar Pin For Weddings, Proms, Pageants And Parties! 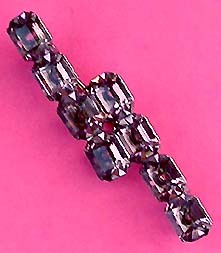 Item #P168236 - Art Deco Emerald Cut Amethyst Crystal Silvertone Vintage Antique Bar Pin. Size: Width: 2 3/8" x Length 1 1/2". 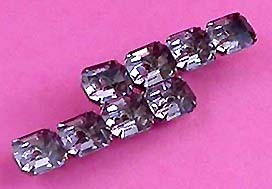 Superb flawless lavender emerald cut crystals exhibiting ultra clear diamond sparkles! This Art Deco bar pin has a small opening behind each stone so that light is refracted through the stones for maximum brilliance. The rivet construction, crisp symmetry and uniformity, and the old style 'c' clasp date this exquisite piece to the Deco era. Excellent condition. A fabulous brooch pin to wear at weddings, prom nights, pageants, parties, cruises and special functions! Price US$148.00.